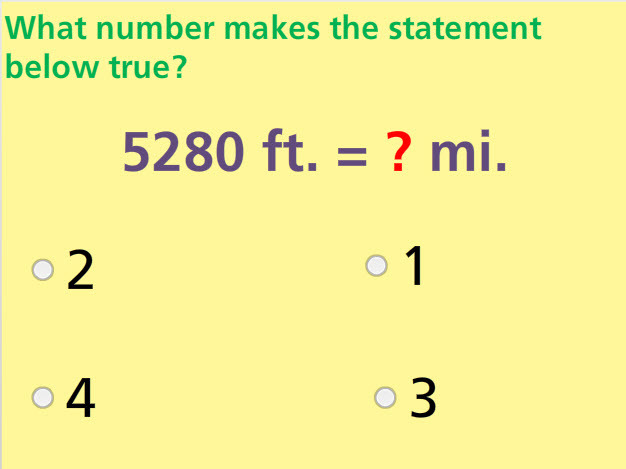 Convert customary units in this online math test. Convert units of length, mass, and capacity. This test has seven multiple choice questions and three drag-and-drop activities. Convert feet to yards, miles to feet, and inches to feet. Convert ounces to pounds, pounds to tons, and pounds to ounces. Also, convert fluid ounces to cups, quarts to gallons, pints to quarts, and cups to pints. Return from this Convert Customary Units Math Test to the Elementary Math Tests, 5th Grade Math Tests webpage, or to Math Tests.